Massachusetts-based People Cube make scheduling software, used by thousands of big companies including General Motors and Procter & Gamble, to reserve physical resources such as conference rooms, hoteling space and teleconferencing facilities. About five years ago, according to CEO John Anderson, the company began selling its system as a way to allocate “hoteling” / "hot desking" space inside companies where mobile workers might need a desk just for one day. Then PeopleCube engineers realized that they could link the hot-desk scheduler into office buildings’ environmental management systems, so that lighting, heating, or cooling could be adjusted to comfortable levels on floors where the hoteling space was filling up and turned down to save energy on floors with lots of empty cubicles. Now PeopleCube has taken this one step further and partnered with a U.K. consultancy called Building Sustainability Ltd. to add a 'carbon dashboard' to the scheduler, so that facilities managers can see exactly how much carbon dioxide is not being emitted into the atmosphere thanks to their scheduling efforts. This is an example of how resource management technologies that companies pursue primarily to save money can also contribute to efforts to arrest the development of global climate change. 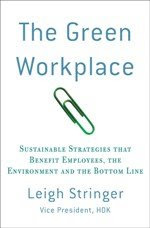 By adopting a 'hoteling' / 'hot-desking' work style is also a boost for the corporate PR agenda of companies, as they acquire a "green sheen" by reducing the amount of real estate they have to heat or cool, which reduces their carbon footprint. For more information on this, and further discussion on the difficulties of benchmarking your baseline emissions, which is key to this software, click here. It is really a green work place. The office is looking great. I will surely visit your blog in future also. I have sent u a message in the Blogcatalog shut box also. Pls check the message and reply me. My name is admilson.